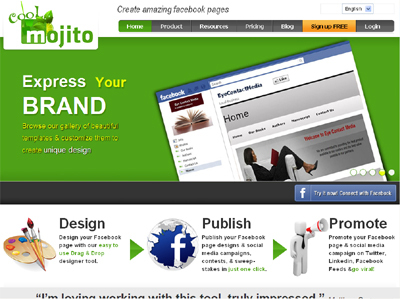 Cool Mojito lets you create a professionally designed Facebook page within a few minutes, for free. It’s as easy as dragging a widget with our drag and drop widget-based interface. You can even create a store to sell your product or service, and campaigns to promote your business on your Facebook page. You can easily create pages with rich text, banners & images, videos, maps, audio, games, storefront, sweepstakes, contests, contact forms, leads database and more. It’s Multilingual & scalable. We’re the best option for small businesses market, promote, and monetize their website on Facebook, Google+ and the top social media websites.